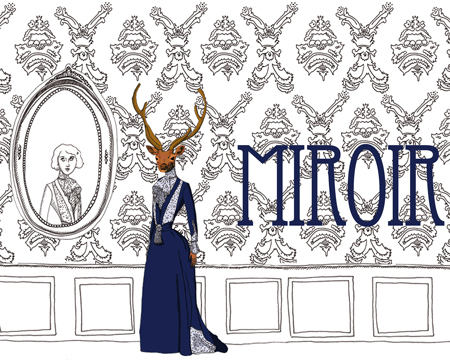 Miroir is an artistic installation using augmented reality technology. The visual decor and sound has been designed to immerse the viewer in a strange universe. The mirror is an object often linked to illusion. In Lewis Carroll’s Through the Looking-Glass, the mirror symbolizes the portal between the real world and a world that is strange. As a star attraction at carnivals, the hall of mirrors allows viewers to see images of themselves as multiplied and distorted. A curved mirror is also necessary to achieve the visual trompe l’oeil as anamorphosis. So it’s no coincidence that the mirror is at the heart of the installation – it is the open window to another world. The extraordinary feature here is the transformation of the face of the viewer into an animal face. The aesthetics are a blend of naturalistic paintings and Japanese print. The literary references associated with the anthropomorphic are many, ancient myths, Ovid’s Metamorphoses, Les Fables of La Fontaine, and Japanese Mythology. Anthropomorphism is a method used by cartoonists to denounce the atrocities of people by giving them the head of the animal to which it grants negative qualities. In addition to being caricaturist, Grandville is also known to have illustrated the first edition of Les Fables of La Fontaine. Once he has looked in the mirror, the viewer can interact with its double anthropomorphic, an augmented reality that allows the viewer to merge with the supernatural.